TROLAK, PERAK, 7 June 2014 – A programme organised by The National University of Malaysia (UKM) has been launched to help encourage children of FELDA settlers to choose Science, Technology, Engineering and Mathematics (STEM) for their careers. 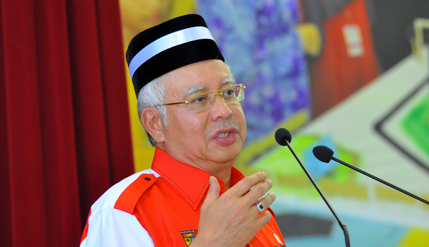 Prime Minister Dato’ Sri Mohd Najib Tun Abdul Razak who launched the programme today said the Bitara STEM Felda-UKM, a unique scheme for FELDA students, was timely as Malaysia is in dire need of a technology-driven economy. The five-day camp held at the MARA Junior Science College (MRSM) here involved 200 Form One to Form Three students, all of whom are children of Felda settlers, with 70 undergraduates from UKM acting as facilitators and 20 lecturers as mentors. The camp is an initiative under the Global Science and Innovation Advisory Council, which is chaired by the prime minister and initiated by the New York Academy of Sciences. In his speech Dato’ Sri Najib said the country is still lagging behind in good results for STEM subjects even when compared to countries in the region. Emphasising the importance of acquiring knowledge in STEM, he said, more serious attempts are necessary to make it work. “This is serious, as we have to compete with many other countries in the 21st century. Efforts by all parties must be taken to ensure we have more graduates in these fields,” he said. At present 60% of students are in the Arts stream while only 40% take up STEM subjects when it should be the other way around, he said. He noted that Malaysia is ranked in the bottom third of a survey in the Prog­ramme for International Stu­dent Assessment (PISA) ranking for 2012. For the Trends in International Mathematics and Science Study (TIMMS) test, Malaysia ranked 26 out of 42 countries and almost 38% of students aged 14 failed to score the minimum marks for Mathematics and Science, he said. He said the Education Ministry had acknowledged this fact when assessing students through various methods and surveys. Most students not only had the perception that the subjects were tough but felt that the subjects were not interesting enough for them to pursue. Such a perception, attitude and low motivation are reasons why students do not pursue the subjects at a higher level, let alone find a career related to STEM. “Everyone has an equal role to play in encouraging students to have an interest in such subjects,” he said. The Prime Minister also announced the setting up of a STEM lab at MRSM Felda Trolak, which would also be expanded at all Felda districts beginning next year. He said the 10 best students from the lab would be given the opportunity to attend an international STEM camp in New York at a date to be announced later. Present at the launch were UKM Vice-Chancellor Professor Dato’ Dr Noor Azlan Ghazali, Deputy Vice-Chancellors Prof Dato’ Dr Mazlin Mokhtar, Prof Ir Dr Riza Atiq OK Rahmat and Prof Datin Dr Noor Aziah Mohd Awal, Education Faculty Dean Prof Dr Lilia Halim who is also the programme implementation chairman and coordinator Dr Mohd Sattar Rasul. The prime minister also visited the various science projects set up by the students.